Organizing my scraps by storing them in color coded fabric baskets has been on my To-Do List for quite some time. I wanted quick and easy baskets to make. No handles, zippers, cardboard or plastic inserts, magnets or Velcro. Pam, over at Threading My Way, posted a fabric basket tutorial that fit my need. I changed the size of the bag (mine is larger), and I used Timtex, since I already had that on hand, and wanted to use it up. 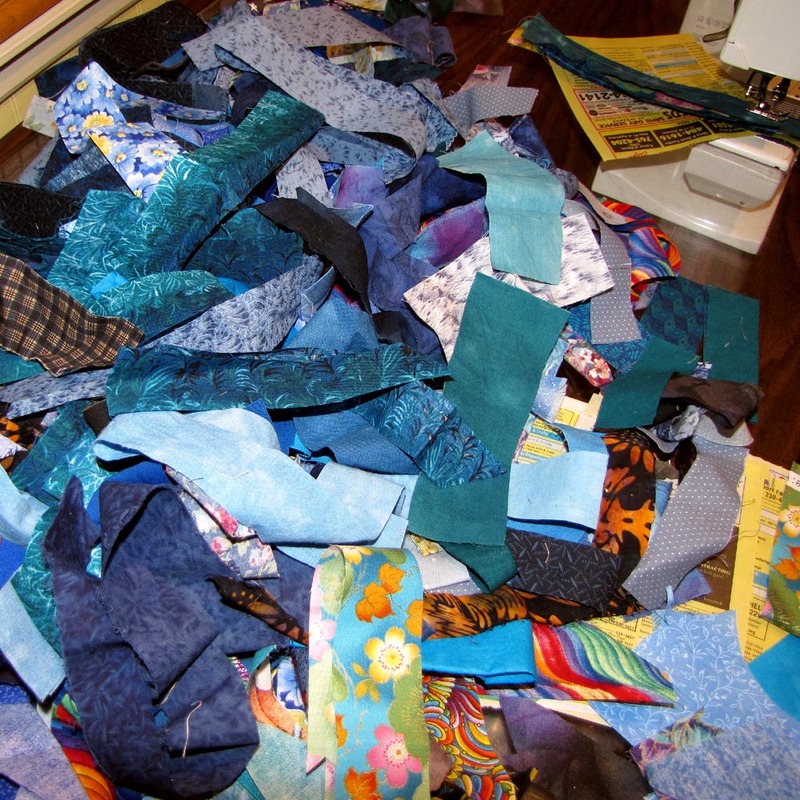 Now that the scraps are no longer “out of sight; out of mind”, I hope to use them more in projects. It will certainly be a lot easier to find them! And I like the way the bags look on my shelf, too! My six year old granddaughter and I decided we had time for one more project before her visit with me ended. So we drew a project in Electric Quilt, and printed out templates. Alyssa used Crayola crayons to color her fabric butterfly and flower. Then she cut out and fused the parts to a simple background that we had sewed together(Grandma applied fusible web to the fabric before Alyssa cut into the fabric) . We had a very enjoyable afternoon crafting together. For the curious, G Mom represents Grandma. I don’t think Alyssa could figure out how to spell Grandma. And I see an ‘oopsie’ that we need to fix. We forgot the butterfly antennae! We shall get that done before she goes back home! 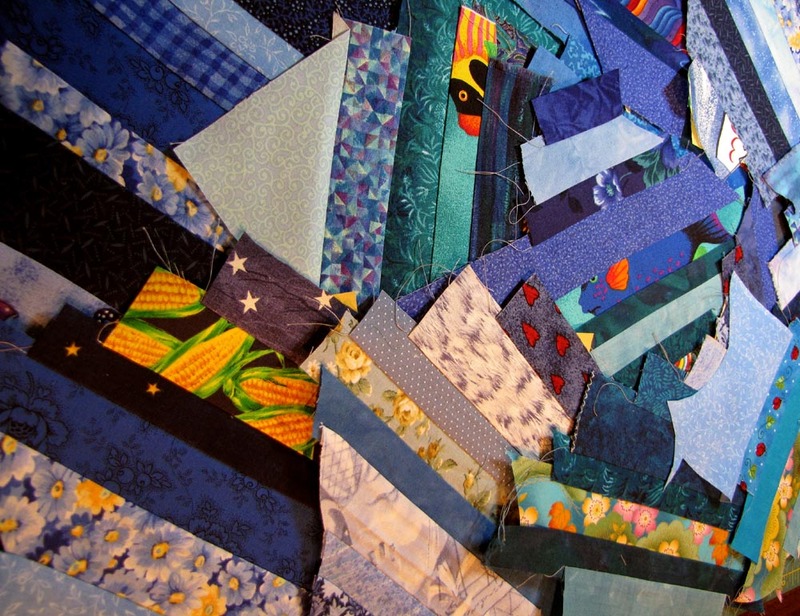 *Update: Featured in Electric Quilt User Spotlight. I’ve had the pleasure of having my four year old granddaughter visit for a few days. In fact, the pass has been closed periodically with avalanches, so it may take her parents a little longer to come get her. Add to that, heavy rain here, so going out is not an option. So what shall we do? Alyssa and I have come up with a fun project. 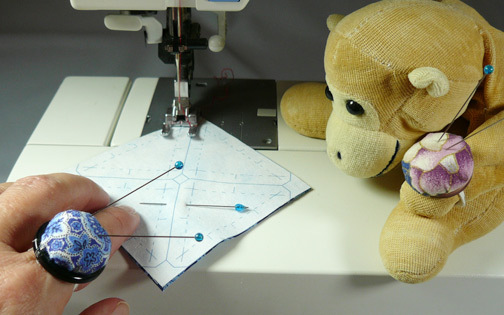 In these two photos, she is busy using various objects to trace different size circles onto paper-backed fusible web. Alyssa really enjoys peeling the paper from the fusible. And here she is, choosing threads to applique her project with. Now you and I could finish this project in an afternoon, but a four year old needs a little more time. There are other things that are calling out to her…like playing ball with the dog. So we’ll finish this later. 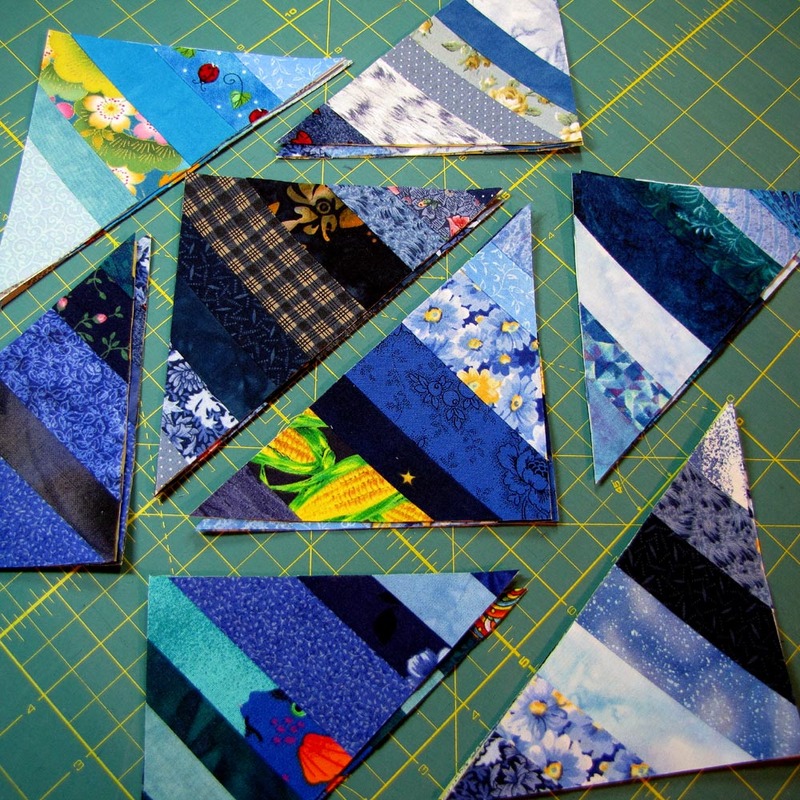 Part 2 was all about warm string blocks, so I’ve chosen to sew Part 4’s string blocks in cool blues. No planning here; I’m mixing it up. Confederate blue, teal, light blues, dark blues, some purple thrown there, floral prints, corn, Asian prints, hand-dyes, dots, whatever I have on hand. All pressed and lookin’ good. Trimmed up. Will they play nice? It’s a mystery. But I’m likin’ it! Part 2 mystery instructions calls for piecing 72 string blocks. Strings? 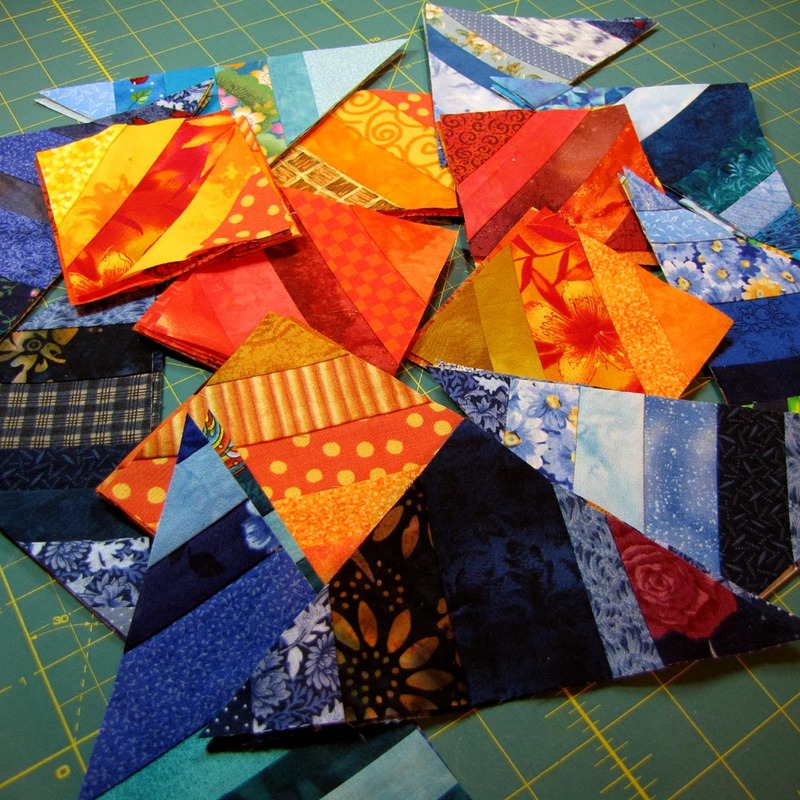 In a nutshell, string piecing is taking cut fabric strips, or scraps, and piecing them together, using a stabilizer for backing. The stabilizer can be used dryer sheets, muslin, newsprint, interfacing, etc…. 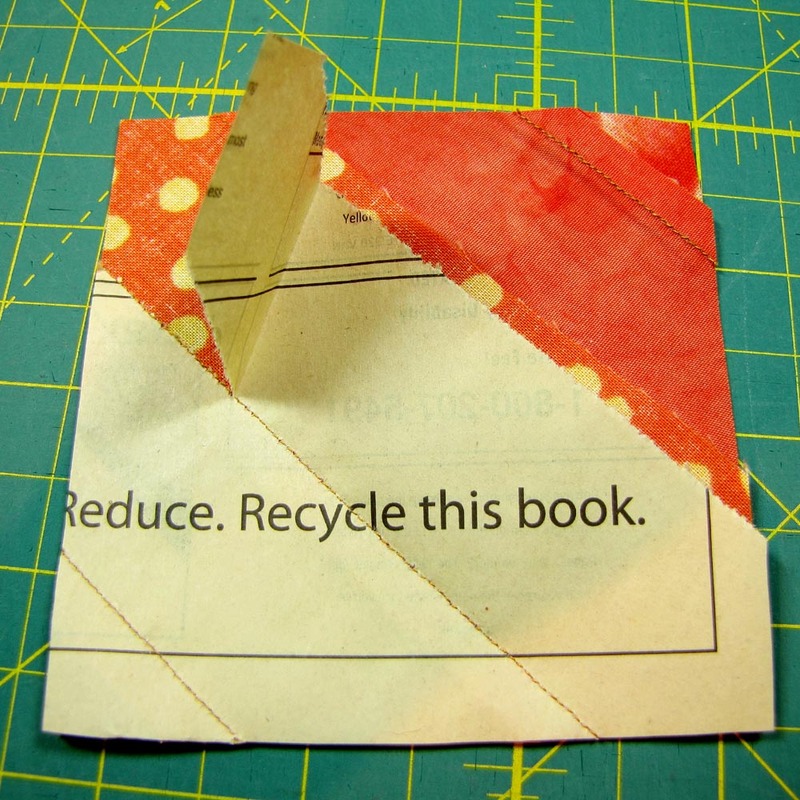 In my case, I’m using old phone book pages. 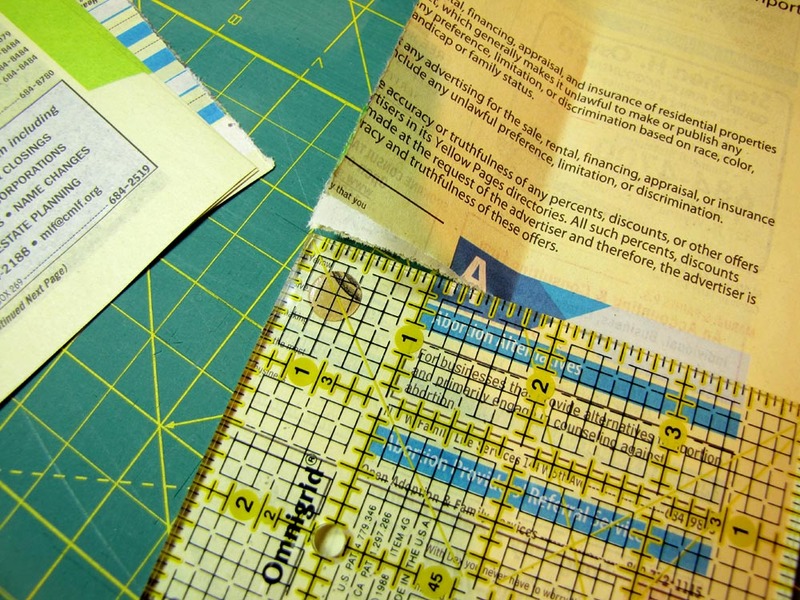 I had all 72 paper squares prepared in a very short time by simply tearing with the edge of my ruler. 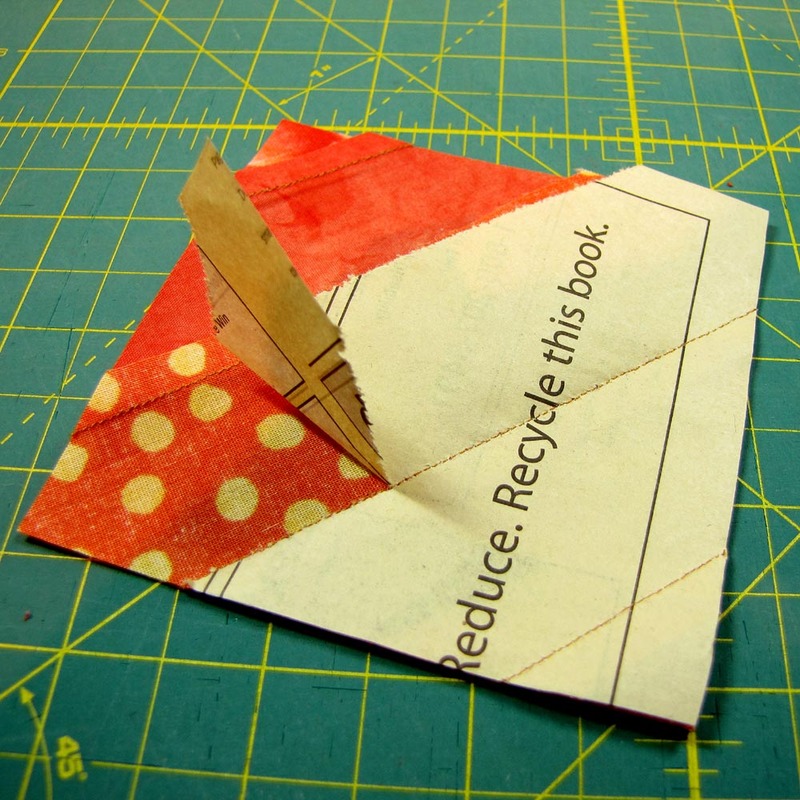 No rotary cutter necessary. Simply tear. I was very indecisive about what color these scrappy string blocks ought to be. 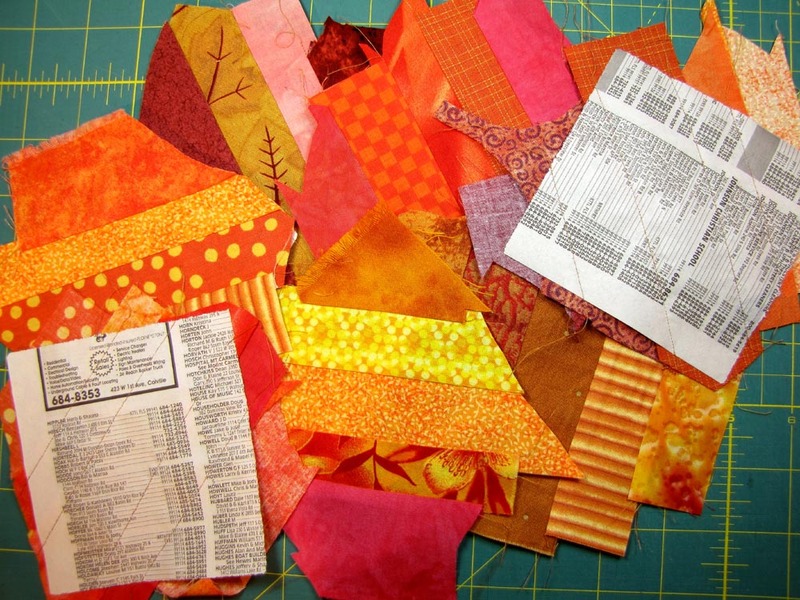 Should I use orange (one of my very favorite colors)? How about yellows? Then I remembered that one of my goals for doing this mystery is to ‘lighten up’; be random. So…how about I use a warm palette? Then I can have it all. 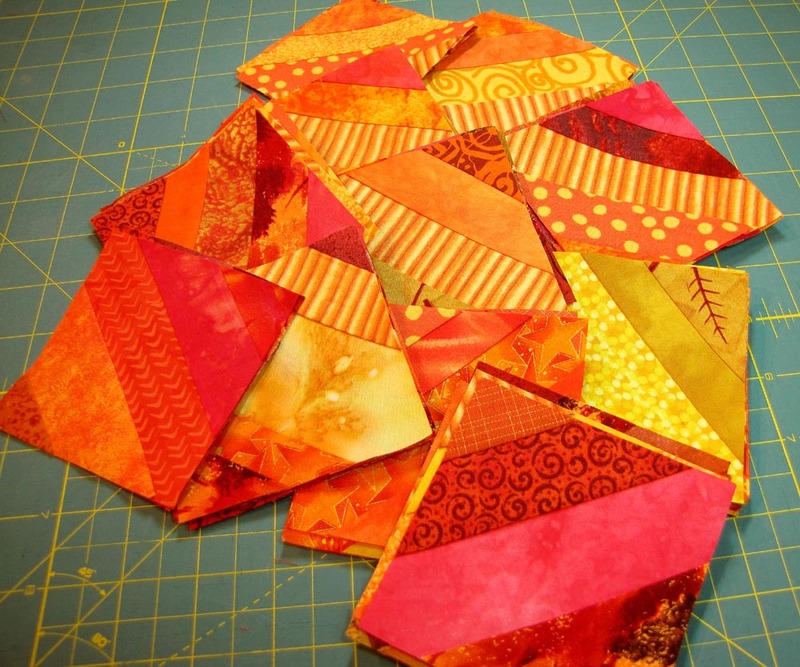 A fabulous, feel good warm pile of unsquared string blocks! Pressed and peeling paper! Oh, the excitement of it all! 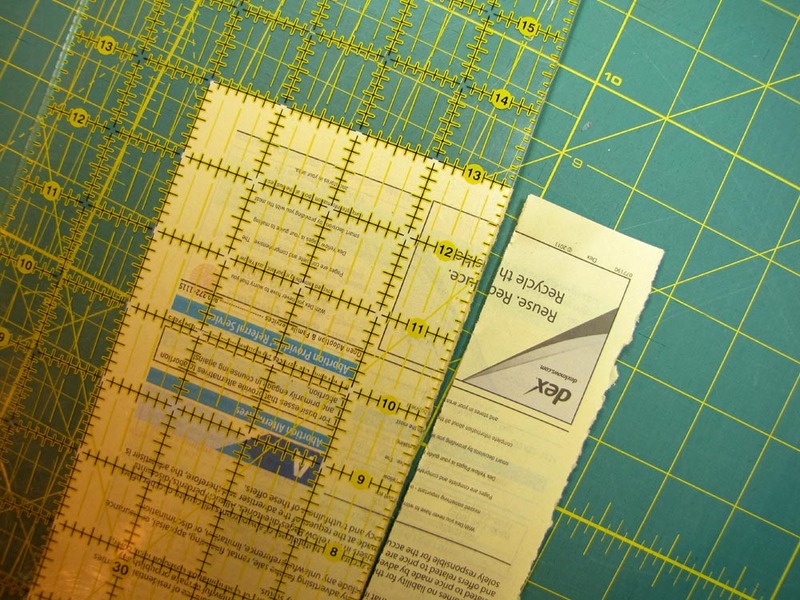 The paper practically falls off when a short stitch length is used. And a closer look. What a funny bonus! I did not notice what this phone book page said until I was snapping this photo. I’m doing my part to go green! 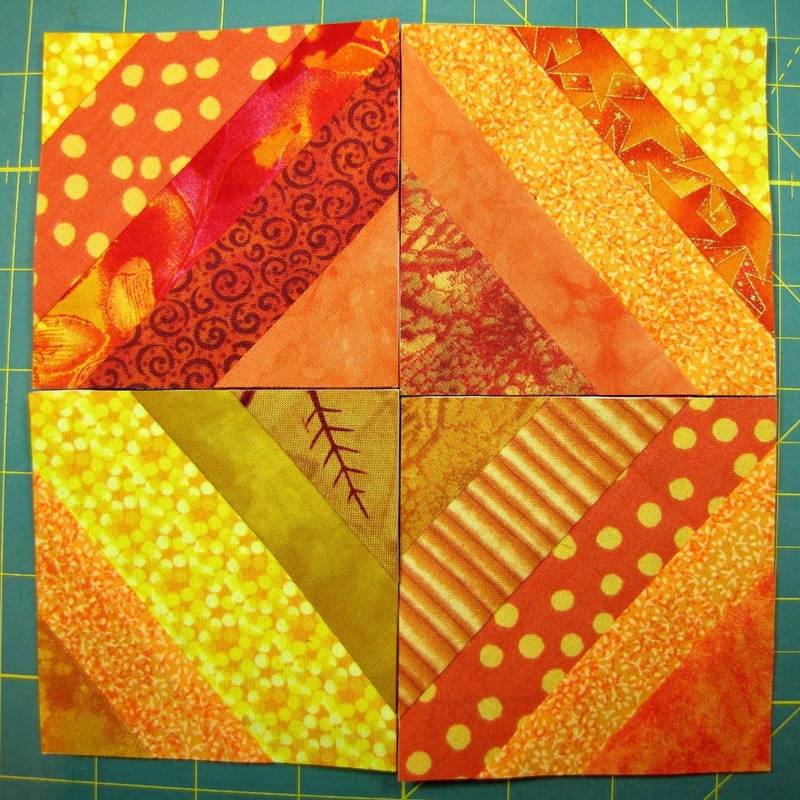 Four of the string blocks, pressed, squared to 3.5″, and peeled. These little babies are sweet!